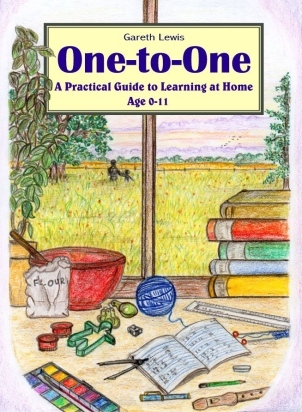 One-to-One is a book about learning at home with young children (age 0 - 11), which my father wrote a couple of years ago. Bethan, Samuel and I provided the illustrations, and we also helped with the editing, proofreading, cover, craft and cooking sections. For a long time, over the years of being at home, we discussed the possibility of writing a book. Some things that we did at home so obviously worked, and other things were never enjoyable. If we wrote a book about what worked, then other families needn't make the same mistakes, and they would find in our book a great collection of some of the best things for a parent to do when they and their children are at home together. It was written with home-educators in mind, seeing as this is what we have always done, but we were also aware, when writing it, that it could be of great use to parents of children who do go to school. It could also be useful to Grandparents, or close relations, and, in short, anyone who spends time with children. As someone who bought it said "this book is of use to anyone with kids!" One-to-One is a book with several sections in it. Play: My father writes about the importance of play, and recommends the best toys for children. Art: He here discusses which materials are the best for oil-painting, watercolours, charcoal, sketching, and modelling, plus tips about doing all these subjects with young children (all very good advice which one seldom reads!). Writing: When and how to teach children to write. There are pages of letters to copy, to give your child beautiful handwriting. This is how I learnt to write, so I can tell you from experience how good it is. My handwriting used to win prizes and the calligraphy I do now is thanks to the way I learnt to write. Reading: In this section there is a lot on how to teach a child to read, as well as many pages of recommended books to read to children, from toddlers to eleven-year-olds! They are all the books Bethan, Samuel and I really enjoyed when we were little. Mathematics: This section was in danger of taking over the book, and the fifty pages it now covers is small compared with what it could have been! In it are the clearest instructions I have ever read for how to add, subtract, multiply, and divide, as well as enough advice, encouragement, and good sense about maths to reassure any parent! There are also instructions for games at the end - battleships, card games, dice games, dominoes etc. to make sure your maths lessons will be good fun! Gardening: How to grow flowers, vegetables, herbs, tropical plants and citrus plants with your children. Everything from an onion to a passion fruit vine, all of which is written from sound personal experience. This section ends with how to encourage wildlife in your garden and how to make a bird table. Cooking: This is a big section full of all our favourite recipes which are simple enough for a young child to do. World cuisines, including: Indian, Mexican, Chinese, Italian, as well as how to make bread, buns, soups, biscuits, scones, and cakes - all with very clear instructions and pictures for nearly all of them. Crafts: So many young children love to do crafts - I know I was one of them. The trouble is most crafts are too tricky for little fingers and the easier ones can end up looking ugly. This section is full of all the simple crafts that not only work but look beautiful at the end. Greetings cards, wrapping paper, jack-o'-lanterns, pompoms, simple embroideries, a woven pencil case, how to knit and some knitting patterns, cross stitch, candle making, papier mâché, and more!! If your children like crafts they will find plenty to do here. Additional Subjects: Discussed here is music, languages, science, history, and geography. For most of these subjects it is suggested you wait a little while, unless the child has a real drive to do them. Our other book, Unqualified Education, discusses them in great detail. The book is 318 pages long with as many illustrations, and it has cartoon strips running along the bottom of many of the pages. As you can tell, it is jam-packed and there is no wasted space. It is one of the fullest books I have ever seen and at £12.50 is very cheap! It is always impossible to know what a book is like before one buys it online but it might reassure you to know that we get a lot of our sales this way and people always seem highly satisfied with the product. One thing they often say is "I just wish I had known about it sooner" which is one of the reasons I am putting this page on the Jamboree. I believe this book could help many families all across the world and that if more people knew about it, it could mean the happier childhoods of more children.